Tokyo Ghoul Rebirth is a unique action game from Bandai Namco Entertainment. Create teams of your favorite characters and join the battle of Ghoul vs. Human. Haise Sasaki and Quinx from the latest season, Tokyo Ghoul:re, join the fight alongside Ken Kaneki, Kisho Arima, and other popular characters from the first two seasons of the anime. Choose from over 100 characters and form a team of 6 split with 3 in the front line and 3 in the rear. Deal consecutive attacks using skills and character switches to achieve combos. Power up your characters and upgrade their kagune and quinque to get special abilities. Gather items to upgrade your weapons and strengthen your characters. Each season, players are split into Ghoul and Human and fight for control over the wards of Tokyo through battles and Dispatch. Face tough enemies such as Rate SS Ghouls and Special Class Investigators. 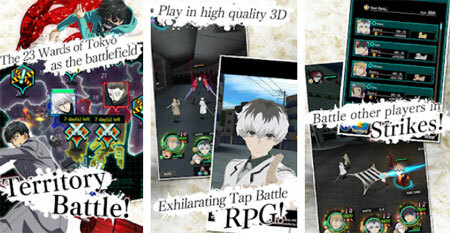 The game features beautiful anime visuals that combine 2D illustrations with 3D models. If you get stuck in the game, check out the video walkthrough and gameplay for the game. This entry was posted in Android Games, iOS Games, Mobile Games, Walkthrough and tagged Tokyo Ghoul Rebirth Cheats, Tokyo Ghoul Rebirth Game, Tokyo Ghoul Rebirth Gameplay, Tokyo Ghoul Rebirth Guide, Tokyo Ghoul Rebirth Hints, Tokyo Ghoul Rebirth Review, Tokyo Ghoul Rebirth Solutions, Tokyo Ghoul Rebirth Strategy, Tokyo Ghoul Rebirth Tips, Tokyo Ghoul Rebirth Walkthrough by Marvin. Bookmark the permalink.